It doesn’t really matter if Glen Campbell was Jimmy Webb’s best interpreter or if Webb gave Campbell his best songs — in other words, it doesn’t matter who helped the other more — because it doesn’t change the essential fact that the duo fit each other so naturally. Webb’s intricate, idiosyncratic compositions sounded warm and accessible in Campbell’s hands, while the songs revealed Campbell’s musical range and ambition. Other singers had big hits with Webb’s songs and Campbell made tremendous music with other people’s songs, but there was something special about their collaboration that was evident on their big hits of the ’60s: “By the Time I Get to Phoenix,” “Wichita Lineman,” “Galveston,” “Where’s the Playground, Suzie?.” These songs provided the background for Reunion, the 1974 album where Campbell and Webb reunited for a set of Webb songs. Well, that’s not exactly accurate, since Webb never produced or arranged the hits Campbell had in the ’60s, and the record isn’t entirely written by Webb, since it features Susan Webb’s “About the Ocean” and Lowell George’s “Roll Um Easy” (here retitled “Roll Me Easy”). So, this marks the first time that Webb arranged a full album of Campbell’s, along with providing the majority of the songs, a move that in many ways made this closer to a Jimmy Webb record than a Glen Campbell LP. Certainly, it favored Webb’s idiosyncrasies, particularly his elliptical songs with winding melodies and no straightforward songs. Not a song here outside of “Roll Me Easy” announces itself as a potential single (which very well may be why this tremendous song was added to the play list, particularly as the first single, since it might be the easiest way into the record for most listeners). Since most of the songs share a similar easy mid-tempo pace and have similar lushly interwoven arrangements, it’s not necessarily the most accessible of Campbell’s records; it doesn’t set out to alienate, it’s just that Webb’s songs and arrangements call for close listening, which is precisely why it’s an album beloved by Campbell/Webb connoisseurs. So, it’s not entirely surprising that the record didn’t make much of an impression, certainly nothing close to their big hits of the ’60s, but rather that it’s become a cult item, with some fans regarding it among Campbell’s best work. And, in many ways, they’re right. 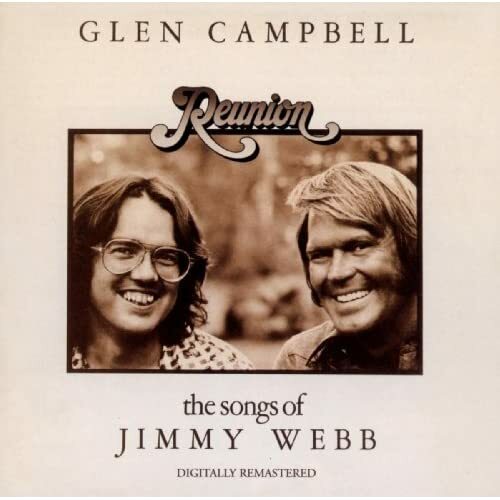 Reunion has a quiet power that grows with repeated listenings since it does indeed showcase Webb at his best as songwriter/arranger and Campbell as an interpretive singer. But this is very much a record for the dedicated, those that are already convinced of the strengths of both men, because it reveals its gifts slowly, and even when they’re out in the open, the songs are so delicately, if exquisitely, crafted they’re best appreciated by listeners with an eye for detail. Those listeners will surely find Reunion among Campbell’s best work, and it is certainly among his most consistent and ambitious records, but it’s just a little too reserved to play to an audience outside of the already converted.